We were supposed to have ramen for dinner last night, but I had the oddest craving for hominy and southwestern flavors. Luckily, we had dried hominy in the pantry so this was a cinch to throw together with stuff we had on hand. This was so hearty and satisfying, exactly what I was craving. I love the texture that the hominy brings to stew, that little bit of chew. The seasonings give it a smoky flavor with just a touch of heat. The kale adds some green vegetable in the middle of winter. I cooked this on the stove making it a one dish meal. You could also do it in a crock pot, but I would sauté the vegetables first. Heat the olive oil in a large saucepan over medium-high heat. Add the carrot, celery and white parts of the scallion. Sauté until starting to get tender. Add the garlic and sauté a minute more. Stir in the tomato paste, hominy, stock, tomatoes and spices. Bring to a boil. Cover and reduce heat to a simmer. Let simmer for about 4 hours. The hominy should be tender but still al dente. Add the kale and chicken, increase heat to medium. Cook with the cover off for 15 minutes. Serve topped with green parts of the scallion. Dining Alone - We buy it dried from Rancho Gordo but I think most stores sell it canned. If you used canned you could cook this up in like an hour but I'd reduce the stock or it'll be more soup than stew. Hmmm hominy! 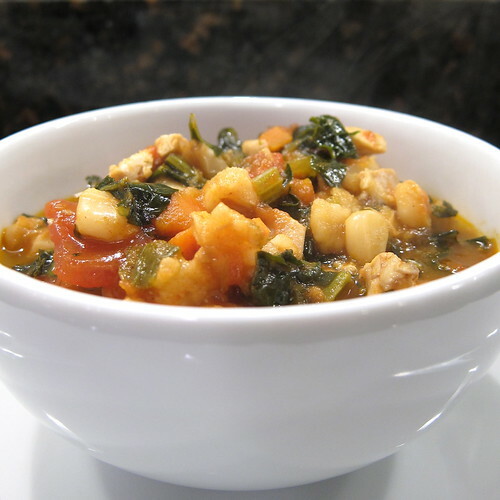 I love the way you made this stew, kinda like a healthier version of pozole, hehe. 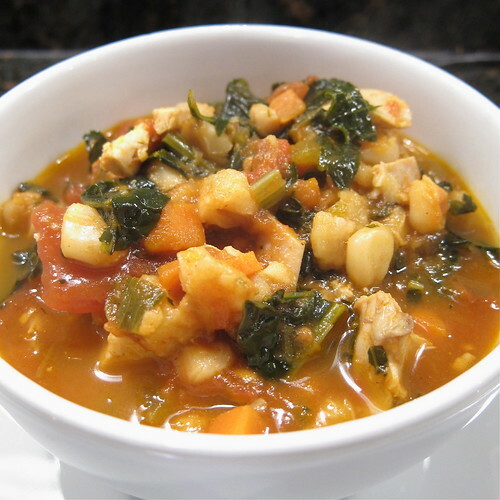 how marvelous to see hominy used in something besides posole! my grandpa makes gallons and gallons of the stuff every year and we never know what to do with it all! Sounds like a delicous and hearty meal! This looks and sounds so good. I may have to make something very similar. No kale on hand tonight, but I do have broccoli. Or maybe some poblanos... Oh! The possibilities.